‘Scene v. Scene’ is a series of articles aiming to shed new light on key scenes from television dramas by comparing them with scenes from other programmes or films. This isn’t just about pointing out ‘influences’ or comparing styles or tagging intertextuality (although those things might happen sometimes), and also is a more bloggy, less academic approach than usual on this site – however, the case studies will be chosen to also raise wider issues about television drama. 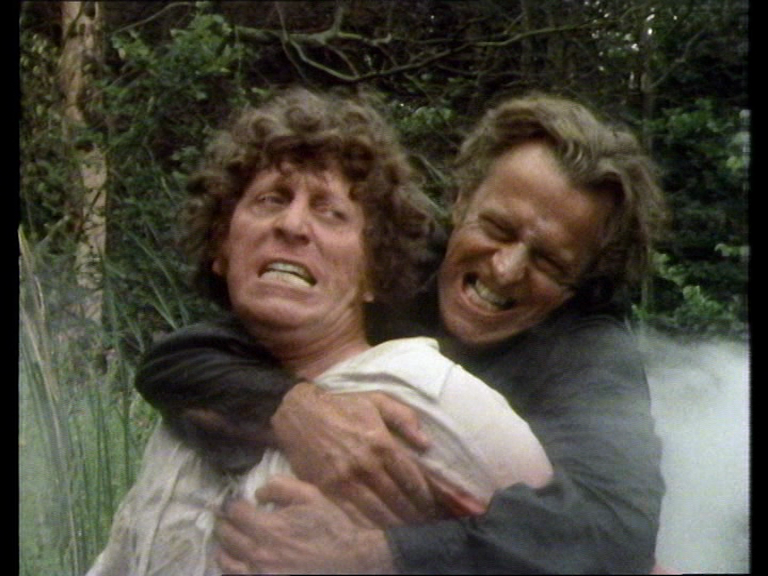 This is true of the case studies in this first article, two-aquatic punch-ups: the Doctor’s fight with Goth in part 3 of Doctor Who’s ‘The Deadly Assassin’ (BBC1, 13 November 1976) and Kline’s showdown with Rawlinson in the Play for Today (in effect series pilot) Gangsters (BBC1, 9 January 1975). They have a lot in common, both on- and off-screen. Before we start, we should place the scenes in context: Kline is fighting a crime boss in the river Tame in Birmingham, near the end of a hard-hitting single play about multiculturalism, drugs, illegal immigration and, well, hard-hitting. The Doctor’s fight takes place in a wilderness contained within the virtual reality of ‘The Matrix’, a dreamscape accessed by linking brains to computers (yes, it would be too easy to compare it with The Matrix (1999)!) on Gallifrey. Both scenes are shot on film: Gangsters was all-film, Assassin typically for 1970s Doctor Who mixes studio video (here depicting Gallifrey) with filmed exteriors (here restricted to the scenes set in the Matrix), though part 3 has an unusually high number of filmed scenes. We’re not here to compare the styles of mid-1970s TV dramas, though that can be a rewarding and surprising process, especially given that directors and film cameramen (directors of photography) on contracts could be asked to move between very different types of drama. There are all sorts of reasons for similarities in the approaches of these two dramas, including the fact that the writers of both pieces – Robert Holmes (Assassin) and Philip Martin (Gangsters) – often riffed on Westerns and other genres: therefore, Doctor Who assimilated The Manchurian Candidate (1962) into teatime SF-horror while Gangsters took The French Connection (1971) into Birmingham clubland. We could compare these punch-ups with equivalents in various Westerns for instance – but the amount that these two scenes have in common says a lot about Doctor Who in 1976 and some of the pressures facing BBC drama. Both plots start with heroes investigated or detained for murder: the Doctor is lured back to Gallifrey in mysterious circumstances to become the patsy for a presidential assassination, while Kline had killed Rawlinson’s brother in self-defence. The Doctor and Kline face a physical battle for survival: the companion-less Doctor relies on his wits in a jungle setting while hunted by Goth, like some teatime First Blood (1982). Post-Watergate, politics (the Presidential campaign in Gallifrey and race politics in Birmingham) is a murky business and, as in The Third Man (1949) or Touch of Evil (1958) before them, moral ambiguity is reflected in key battles in water that both cleanses and makes dirtier. 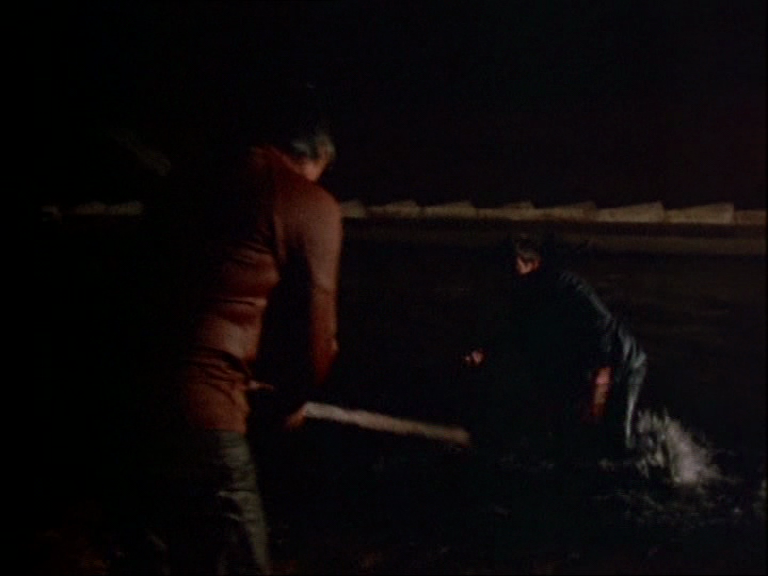 The similarities are quite easy to spot, in terms of similar actions and shots: the ‘hero’ screen-left kicking the villain across the frame into the water; the pair grappling for dominance in the water; exhausting fist-fighting. 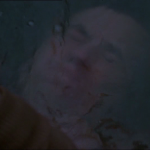 Both culminate in attempted drowning, with the drowner (Goth and Kline) shown looking screen-right in medium close-up, grimacing with the effort of holding their opponent underwater. 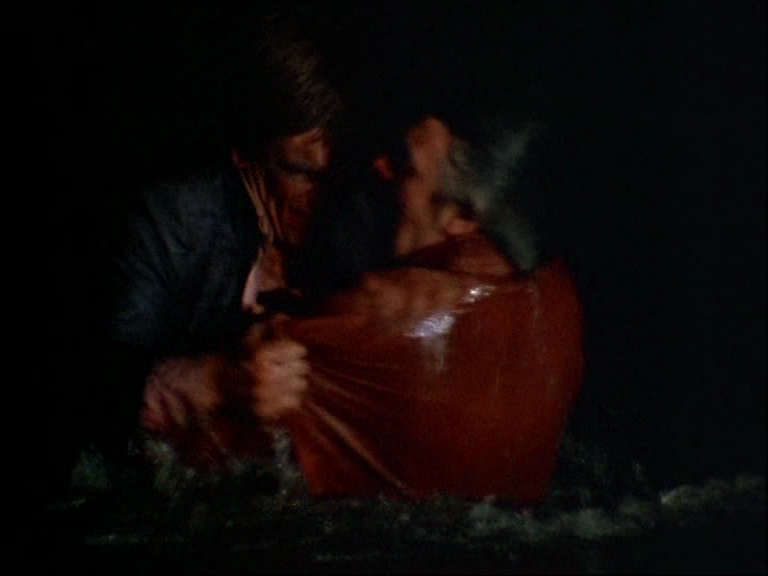 Each victim gets a reverse-shot while underwater, though Gangsters is more precise in its use of shot/reverse and the angle of compositions. These similarities draw attention to differences. Firstly, the morality of Gangsters seems murkier. 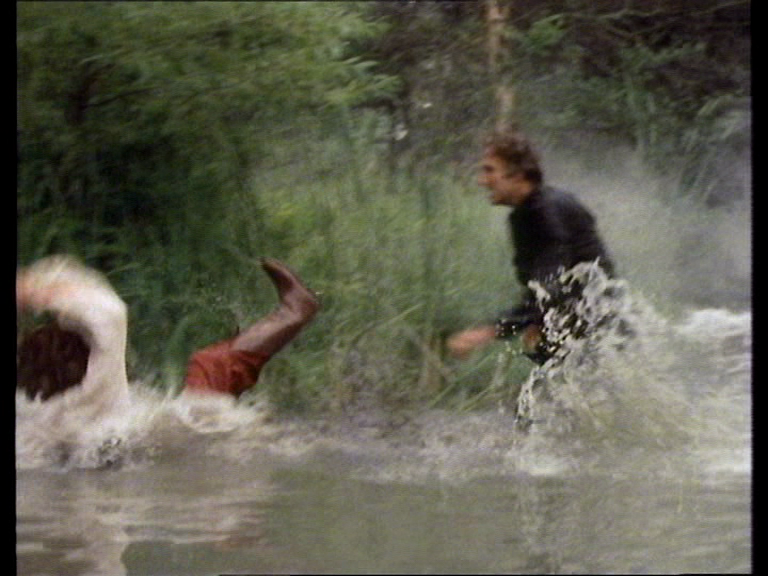 Ex-SAS hero Kline is reduced to another murder, and seems little better than Rawlinson, given the similarity in shot size and composition between drowner and drowned. 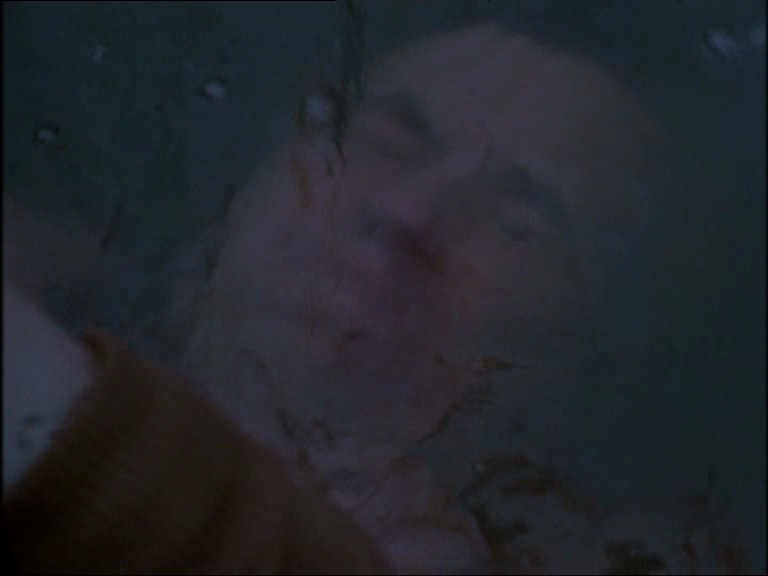 Secondly, the Who drowning is not resolved because of the break between episodes, as the Doctor’s apparent death is held in freeze-frame and we crash into the end credits. 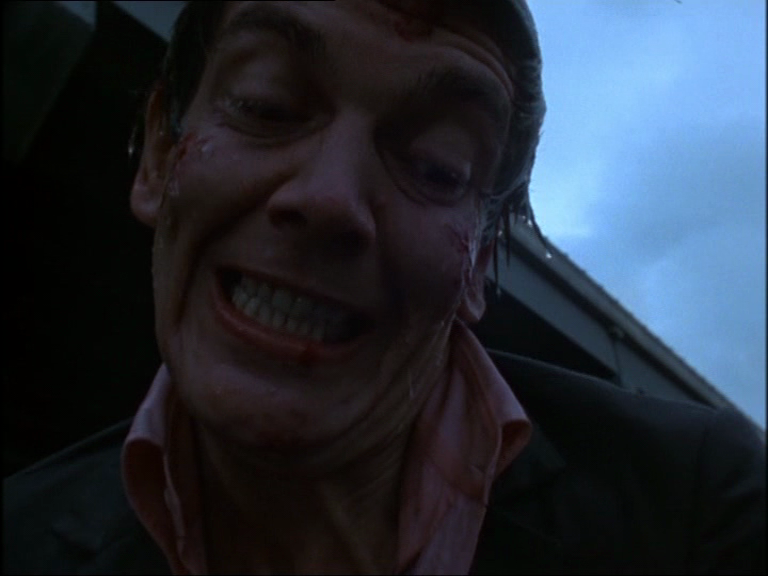 Gangsters’ killing resolves the plot (though killing a Rawlinson brother makes the plot seem circular from Kline’s perspective) whilst Who’s attempt is a cliffhanger. When Gangsters went to a series, Martin would himself employ bold cliffhangers, placing his heroes in moments of jeopardy bursting with excess, deconstructing the Saturday morning serial conventions that Who runs with. Assassin’s power is enhanced by the scene’s status as a cliffhanger moment. In a bound, the Doctor is free early in part 4: Goth weakens and the Doctor whacks him with a conveniently-situated big stick. In the Gangsters fight, that recourse to extra weapons seems cowardly, the villain’s phallic compensation against his rival’s greater masculinity. Is the Doctor’s victory heroic, then, or as steeped in 70s cynicism as Gangsters? There’s heroic coding, of course (at its most basic, the Doctor wears white), but next to Gangsters it seems problematic: the Doctor’s unusually stripped-down costume stresses his physicality (as does Kline’s), but perhaps it also stresses his (period) amateurism against the military professionalism of Goth’s costume. He has to engage with Goth on his terms of engagement, just as Kline is dragged (albeit not resisting) into the underworld. This being Doctor Who, the whack-with-big-stick is quickly contextualised: we return to the world outside the Matrix, the Gallifrey room in which his body lies prone, attached to the system. This reminds us that the Doctor’s victory was won by mental strength, taking one of the programme’s most violent and physical sequences and coding it as the sort of cerebral, individualistic solution we expect from the Doctor. Goth is doomed because of his innate weakness and the ruthlessness of the Master (who is manipulating Goth, the Doctor and events on Gallifrey) rather than the effects of the Doctor trying to set him on fire and clobber him. 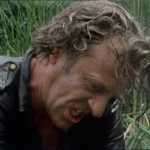 The Master is the unseen villain here, just as in Gangstersthe wider crime chain of which Rawlinson is a part remains in place to cause trouble in later episodes – and the wider social causes remain untroubled by the plot’s hero defeating the plot’s villain. Mary Whitehouse, whose organisation had complained about Doctor Who for some time, emphasised the cliffhanger ending to episode three as evidence of irresponsibility, finding the production team “dumb” for not realising the effects of violent imagery, including the way that “the final shots” of a programme would be “left in the mind of the child for a whole week”1 Fandom has queried this logic, as summarised by Lawrence Miles and Tat Wood: Whitehouse “felt children might not understand that a freeze-frame isn’t ‘real’. She pronounced, with little or no research to back this up, that younger viewers thought the Doctor’s head would be underwater for a whole week”.2 From numerous fanzine pieces through to Jonathan Bignell’s research into children’s reception of the Daleks, James Chapman’s introductory textbook and the sociology angle taken by the Lively Arts documentary ‘Whose Doctor Who’, children have always been seen as an important part of the programme’s audience but also a surprisingly small percentage of it, and stories about their methods of reception, including the pros and cons of the “healthy scare” that they get from the programme, have been staples of press coverage for decades.3 However, the drowning freeze-frame seemed a shock too far, being both relatively graphic and easily imitable. Isn’t there cause for concern when a teatime family adventure show has so many echoes of one of the BBC’s most violent post-9pm dramas of all time? 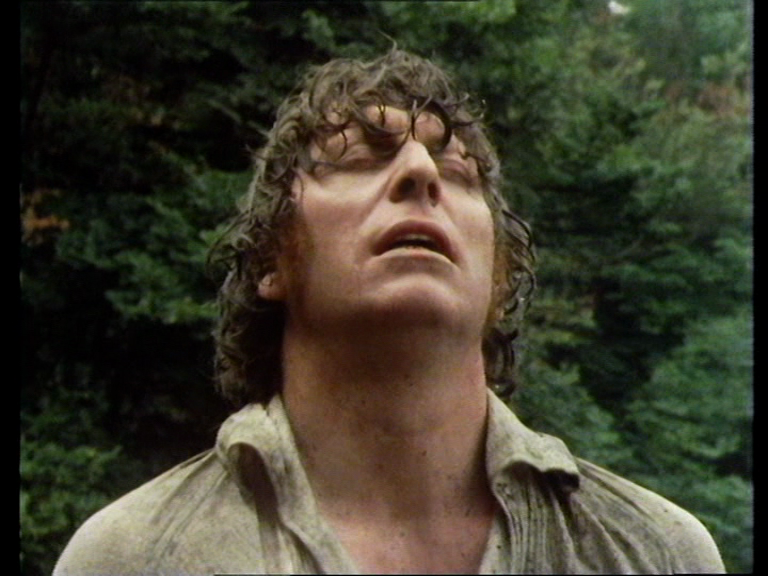 Fandom was right about the drowning scene’s censorship being a turning point, but more attention needs to be paid to the climate at the BBC: even if we discount the fact that Scum and Brimstone and Treacle were banned outright in the same two-year period as The Deadly Assassin, we can find a fascinating parallel if we return to Gangsters. After the Play for Today, it ran for two seasons: the first season continued its hard-hitting tone and violent images, and that season’s sixth and final episode was broadcast just nine days before The Deadly Assassin began. 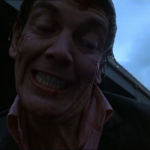 Like Doctor Who, Gangsters was then forced to tone down its violence. Its second season filled the vacuum with more humour and some of the most overtly anti-naturalistic, experimental and postmodern devices in the history of popular television, especially in the episodes directed by Alastair Reid. This season ran in early 1978. Williams’s third season of Doctor Who, season 17 (1979-80) started in September 1979; script-edited by Douglas Adams, who sought “to critique its stale ‘aliens seek to rule the universe’ SF theme” through a move to “modernist” or “meta” SF which, as Teresa Ebert defined it, “employs a self-reflexive discourse acutely aware of its own aesthetic status and artificiality”6. This is an even more accurate reflection of Gangsters. It is perhaps testament to the longevity of formal experimentation in television (from the Experimental Group and Langham Group through such strands as Storyboard (1961), Studio 4 (1962) and Teletale (1963-64) and the well-known primetime work of Dennis Potter), and expectations of audience intelligence that two highly popular programmes should take this turn. Audiences did not necessarily share Mary Whitehouse’s concerns – Philip Martin noted that Gangsters’ second season lost four million of its predecessor’s viewers,7 but Doctor Who recorded some of its highest ratings during this period, albeit with the help of an ITV strike, though elements of fandom posited the Williams era as an aberration for some time. However, postmodernism was not something separate that was imposed on the texts past a certain point after these two scenes were broadcast: there are signs in both of these texts. Gangsters’ playfulness with genre juxtapositions was present from the start, but we can go further. Just as the Doctor defeats Goth, so Kline defeats Rawlinson, who was played by Philip Martin, the programme’s writer. Looking ahead, both series will experience the return of the repressed: the Gothic will resurface, and remains central to defining the series to this day, plus controversy over violence would return in the 1980s (indeed, the actor playing Kline here, Maurice Colbourne, would appear in two of Doctor Who’s daftest offenders of that decade). 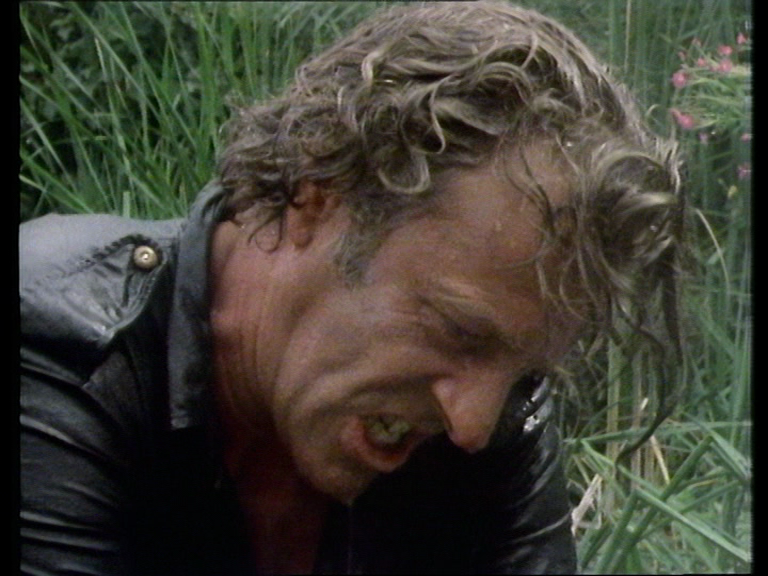 In Gangsters, Rawlinson/Martin’s decline might hint at Roland Barthes’s “death of the author”, but Martin resurfaces in series two, both as himself and as a character who displays disturbing, writerly powers of life and death over other characters: he becomes a deadly assassin. But then, within the Matrix, the Doctor too is locked in battle with his creator: the Matrix nightmare is created by the decaying Master, whose playful, intertextual tastes rival those of Holmes and Martin: but for timing problems causing a change, part two’s cliffhanger would’ve been the Doctor literally cliff-hanging, only to be apparently killed by the severing of a series’ icon, his scarf.8 That scene still appears, but is rarely singled out as one of the series’ great moments, which ironically supports Whitehouse’s point about the impact that can be bestowed upon moments by their serving as a cliffhanger. “I deny this reality,” says the Doctor, and we cut back from film (which, according to many fan critics, represents the “real”) to the studio. Not only that, but the transition is marked by a glimpse of the slit-scan tunnel that forms the series’ title sequence and cliffhanger backing. Maybe that’s why Goth loses interest: his cliffhanger function fulfilled, he knows he can’t kill the Doctor early in part four and stops, defeated by the format. 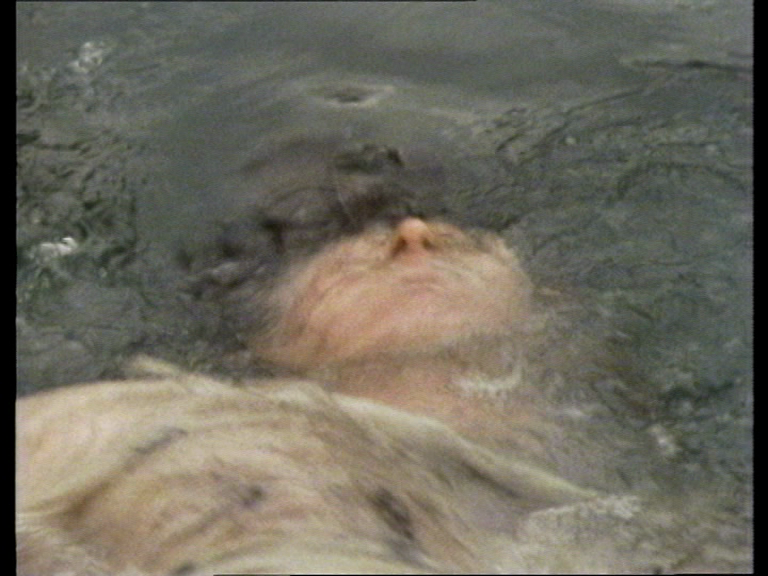 Indeed, while drowning the Doctor, Goth says “You’re finished, Doctor”: add “Who” to that and he could be addressing the episode. Okay, we’d expect that from later Gangsters episodes: characters sometimes tell us when we’ll cut away from a scene, a device comparable to the one that Martin memorably used in his own first Doctor Who script, Vengeance on Varos (1985), when telling Varos’s (in effect) vision mixer, whilst lingering on shots of the Doctor’s apparent death, to “cut it… now”, assimilating his then-signature reflexivity into genre rules. Vengeance on Varos is often read as commentary on “video nasties” and the flak that Doctor Who faced for violence in the 1985 season (flak which Vengeance on Varos itself attracted), but this cliffhanger also recalls the furore over The Deadly Assassin part 3, which also revolved around the point at which the director should cut away from the Doctor’s apparent death throes. But Varos reminds us that such moments are only illusory. Such reflective moments are not restricted to Martin, of course: Holmes’s Doctor Who is similarly playful, for instance rendering the whole production process through metaphor in Carnival of Monsters and anticipating Whitehouse’s reaction to The Deadly Assassin in that story’s Miniscope, with its fatuous ability to engender violence by twisting a knob on a proxy TV set. 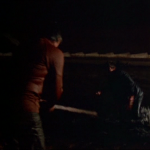 The drowning scene in Assassin has more in common with Gangsters than you might think: scenes of violence that take place in ‘worlds’ that are the domains of their creators (the Master’s Matrix illusion or the postmodernity that will define Gangsters). Kline will later realise the point made to the Doctor: it is a fool to venture into the creator’s domain. Taking these scenes out of context does do them a little violence (and I could have left the writer-based angle to talk about the styles of the directors, given the amount that was contributed to Gangsters by the versatile Philip Saville, and the director of the subsequent series, the distinctive Alastair Reid, in creative collaborations with Martin, and the high reputation of David Maloney in Who circles, and the extra intertextual layers of film homage he often brings to the series). However, how we read such scenes often shifts according to critical context and the changing readings from elements of fandom: in a generation, The Deadly Assassin and the season of which it is a part became read less as a betrayal of proper Doctor Who than as a template for proper Doctor Who. Treating scenes in isolation neglects the fictional narratives of which they were a part, but in this case reminds us that different, sometimes competing narratives applied for viewers and programme makers. Originally posted: 9 September 2011.